Tyneside care home staff have been given a taste of what life is like with dementia after taking part in a special training session. Those working at Waverley Lodge Care Home, in Lemington, had their senses impaired before attempting simple, everyday tasks. Thick gloves, misty glasses and ear plugs were used to make the tasks more difficult and frustrating to complete. This emulated how someone with dementia feels when they find previously straightforward tasks difficult or impossible. 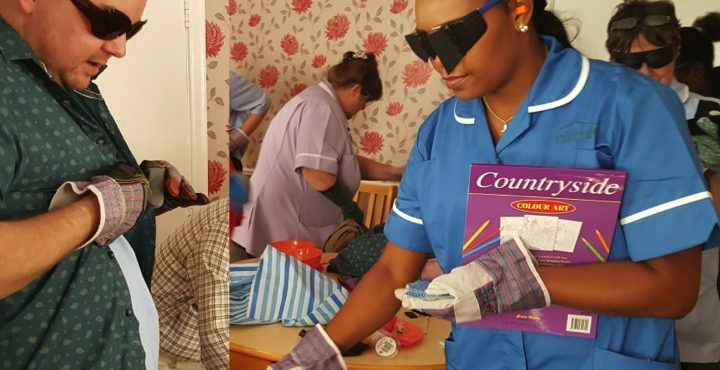 Michelle Park, activities coordinator at Waverley Lodge Care Home, on Bewick Crescent, said: “One staff member had the small pair of glasses on and had to put a shirt on. It was so hard for her. “Another had to get pens and puzzle books and pick up little sticks. “I had to put people’s socks on and get 10 sweets off the table and open them with gloves, glasses and ear plugs. “I had to move up close to the table as it was so hard to do with the gloves and not being able to see as well. Waverley Lodge Care Home offers specialist residential and nursing dementia care and staff work closely with those with the condition. The dementia awareness training session was run in-house by Regional Development Officer and qualified assessor Rachel Hindle.